CTEK™ BC3300 12 Volt Battery Charger 56-158 - California Car Cover Co.
CTEK™ BC3300 Battery Charger 56-158 is the perfect battery charger for all types of 12-volt batteries. Ideal for cars, motorcycles, jet skis, and small size boats. The CTEK Multi US 3300 portable battery charger (Part No. 56-158) is a versatile 12v battery charger in a compact format that makes it convenient and easy to charge and maintain all household vehicles. The special cold mode means that you can also charge during cold winters days without problems. The CTEK Multi US 3300 Battery Charger can be used with 12v lead-acid batteries (Wet, MF, AGM, GEL and Ca). Dimensions (LxWxH) 6.5" x 2" x 1.5"
The Multi US 3300 CTEK charger is perfect for car, vintage car, personal water craft, boats with one battery, boats with start & service battery, scooter, motorcycle, Quad/ATV, lawnmower, caravan, and tractors. 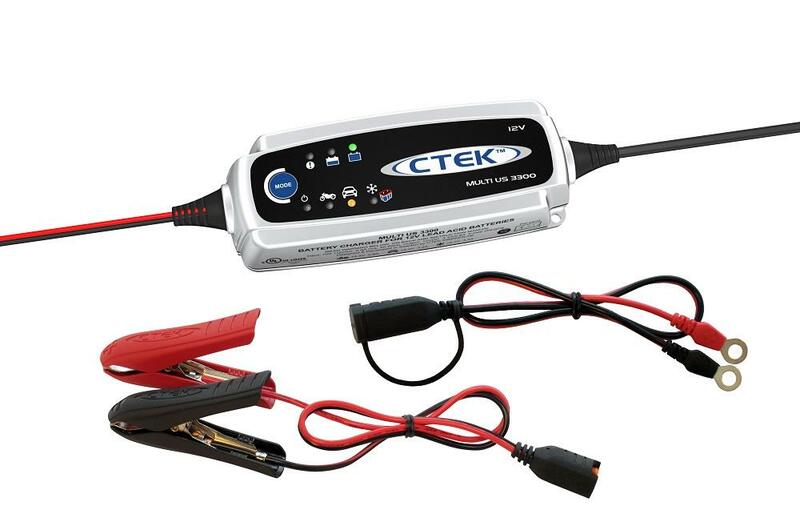 The CTEK Multi US 3300 portable battery charger includes two interchangeable connection leads, one with clamps, and one with eyelet terminals. CTEK offers a wide range of NEW GENERATION battery chargers. Unlike old battery chargers, CTEK chargers are designed with a focus on simplicity, safety and flexibility. The CTEK MULTI US 3300 is the charger that every household needs. It is perfectly suited for motorcycles, cars, lawn mowers, jet skis and any other vehicle with batteries up to 120Ah. Simply connect it and battery problems are in the past. There is no need for any specific knowledge of batteries or their charging methods; the MULTI US 3300 battery charger will take care it. Once switched to the preferred mode, the charger takes its own readings and then begins to charge the battery. Once it is finished charging, it will automatically switch to its maintenance phase - CTEK's patented pulse charging - arguably the most caring mode for a battery connected for a long time. Simply connect it to solve most battery problems from the past. The CTEK MULTI US 3300 battery charger is specifically developed for different needs, vehicles and batteries. There is a choice between three different modes. The low current mode (the motorcycle icon) is perfect for smaller 12V batteries such as motorbikes, lawn mowers, jet skies, snowmobiles, etc. The higher current mode (the car icon) is for automotive or marine applications with larger batteries. Finally, an additional winter mode (the snowflake) is specifically aimed at charging and maintenance in cold weather. It is also perfectly suited for Optima Red Top batteries. The CTEK MULTI US 3300 is prepared to charge and maintain, no matter the weather, temperature or situation. The MULTI US 3300 charger is extremely robust and water and dust resistant (IP65 classification). The MULTI US 3300 is certified for use between -4°F and +122°F. In order to make things easier and more convenient, the Comfort Connect (eyelet terminals) can be permanently connected to the vehicle's battery.